Long before early settlers moved into Logan county, the Bellefontaine area was home to many Native Americans. 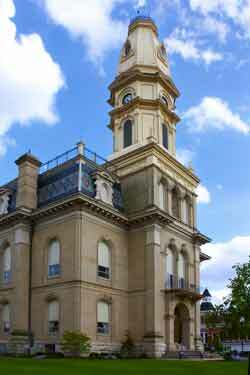 In fact, Bellefontaine was home to one of the most famous Native American's: Blue Jacket. The Shawnee Nation dominated this area during the 1760’s and 1770’s. After the Treaty of Greeneville and the War of 1812, most of the Native American's had left the area and Bellefontaine was officially laid out around 1820. Once the railroads came to Bellefontaine, the area became a thriving center and one of the main terminals for several railroad companies. One of these railroads built the largest roundhouse between St. Louis and New York here. Today Bellefontaine takes pride among many things. One of those is the fact that the first concrete street in America was built there (and 1 block still exists) plus it also lays title to having the shortest street in America that is only 20 feet long. The name Bellefontaine means "beautiful spring" in French. A number of notable American's grew up in Logan County or spent a good of their time there. One of those groups were the Mills Brothers who grew up and attended school in B Bellefontaine. The brothers, John, Jr., Herbert, Harry and Donald were the first African-American vocal group to perform on a national radio broadcast and achieve commercial success. All totaled the Mills Brothers recorded over 1200 songs during their career. George Bartholemew is celebrated as the man who brought cement and concrete to the Midwest. Originally called "artificial stone" in the 19th century, the new mixture called concrete hadn't yet been used to pave streets, but that was about to change our road making forever. George convinced the Bellefontaine City Council that this new portland cement that was being used to construct buildings could also b e used to build roads. That was in 1891. When the City Council gave the go ahead, Bartholemew constructed the street around the Logan County Court House in downtown Bellefontaine. Just in case, George posted a bond guaranteeing that the pavement would last at least 5 years. 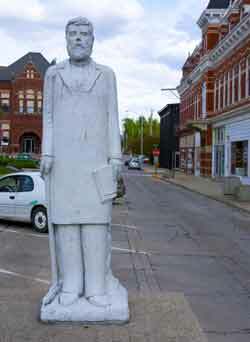 In 1991 Bellefontaine erected a statue of George Bartholemew in the center of that concrete street on the south side of the Logan County Courthouse. The concrete is still there, still being used, and George didn't have to worry about losing out on his 5 year bond guarantee. Now if only today's highways could last 100+ years.